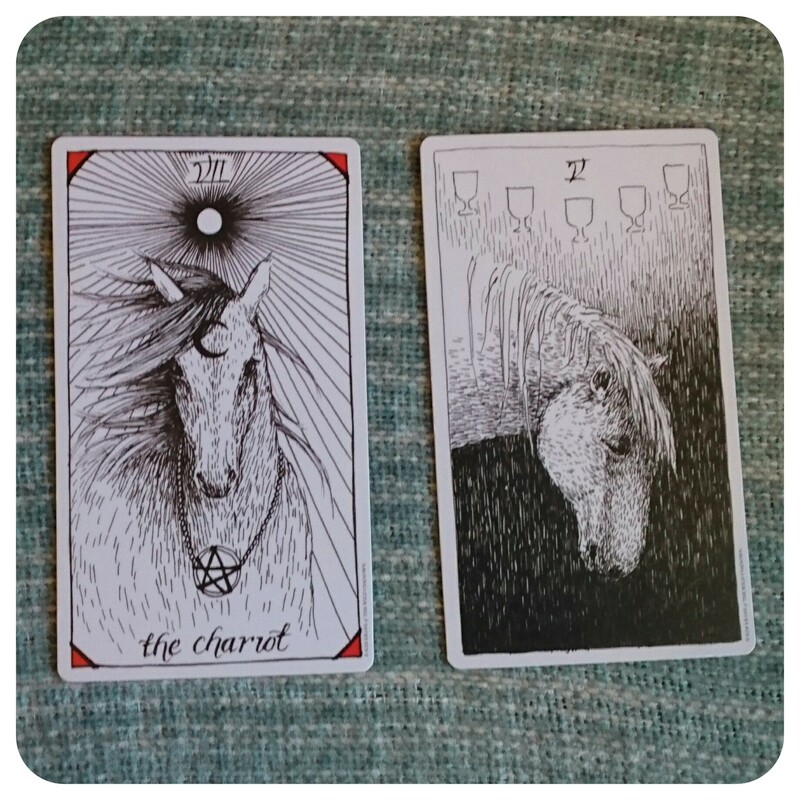 The horse as a symbol of personal power chimes really strongly with my feeling about the chariot card, a horse, in the wild unknown tarot deck. We also saw the horse as a sign of actual power for nobles and wealthy people. Adding an Australian element, there is a free roaming horse called the brumby, emphasising the wild, untamable nature of the animal. As I said in the introduction to these cards, there are some which I’ll already have covered in a lot of detail so there will be some shorter posts. And so we come to the final earth card, the horse. We often think of horses as domesticated but there are still wild horses out there and without humans, they are very much a pack animal. In the wild, they are vulnerable to predators and being part of a group means there are more eyes to spot danger. When danger is approaching, they run as a herd but those out front or at the back are more vulnerable – those of us who are lagging behind or are too ahead of our times? Even the horses we “keep” today are not truly domesticated. We have not subdued them, we have harnessed their talents but they are still free spirits. We have not and I suspect will not conquer the horse, instead, we work alongside it, respectful of it’s wild and independent nature. After all, you can lead a horse to water, but you can’t make him drink. Horses have been around for a very long time and the ancient ancestors of the horse we know today was the size of a spaniel. As we have utilised these majestic beings for our own uses we have bred into them the characteristics we need. Our relationship with the horse has had a huge impact on human civilisation and goes back many thousands of years. Being able to ride horses let us experience the wild freedom of the horse. It allowed us to travel much further than before and much quicker. We could carry more with us when we travelled and our hunting range expanded and we could visit other groups of humans more easily. The horse allowed us more capacity for exploration. It is because of this, and because of their physical traits, that the horse is associated with travel, with moving forward, with journeying and stamina. These are strong creatures with a vitality and driving force which propels you onward. Horses are associated with nobility and wealth and have, in various cultures, been a status symbol, with the rider literally being elevated above most of us. The most highly evolved part of their brain is the part which deals with muscle control and this is important as horses have different combinations of leg movements for the different speeds they go at. By using a particular sequence of steps to trot, a different sequence to canter etc they are choosing the most efficient tool for the job. Horses communicate though body language and will cut through any facade you are wearing. You may look confident and sure but the horse will know if under that mask you’re really scared. It is perhaps this ability to almost see into your soul that led Celtic myths to associate the horse with clairvoyance. Other beliefs around the horse include the idea that horse hair contained magical properties. Linked to the horse and journeys, is a belief that the horse can not only help us travel in this world, but also help us travel to and through otherworlds. I imagine we are all familiar with the horseshoe as a sign of good luck, but did you know they were fastened to the hoof with seven nails which is a lucky number. In India, horses are associated with death and funerals and at the opposite end of the spectrum, Freudian symbollogy associates them with the libido. In Chinese astrology we see the traits of the horse once more as an active, energetic and boundless creature. The Gaul goddess Epona was linked with horses and was worshipped across Western Europe, although due to an aural tradition we know very little about her. We also have the myths about Macha and the Welsh goddess Rhiannon, both related to horses. In England we have a few white chalk horses laying large on hillsides and can often be traced back to the Celts. I don’t intend to go into any detail here but I felt it was important to mention unicorns. These are believed to be a spiritually evolved horse with their horn, their link to the spirit, protruding from their third eye which is associated with insight. We see the horse in both the Chariot and the Five of Cups; two very different cards. The chariot is very definitely my inner warrior and for a while she kept showing up. She reminds me that I don’t need to be in fight mode all the time, part of being a good warrior is about taking time to get your body and mind in shape. She took a while to show up, because I had completely depleted her and she was recuperating elsewhere. Now she’s one of the cards that I go to when I need to channel strength, will power, direction, focus and clarity. She is the very embodiment of moving forward, pushing on and facing challenges. The five of cups on the other hand is about loss and grief. The horse is looking down into the darkness and can’t see the light and the cups above her. Pain and sorrow are an inevitable part of life and we must allow ourselves to feel these emotions. But the horse is a reminder that we also need to keep moving, not get stuck and swallowed up by these feelings.